The holy grail of nitrogen management is an indicator that tells us exactly how much nitrogen a corn plant needs for maximum economic yield. Leaf color (more precisely, the amount of light reflected from leaves with different shades of green) has potential as an indicator of nitrogen requirements. And as a side benefit, this research confirms the value of applying some nitrogen with the planter. The amount of fertilizer nitrogen a crop requires is directly related to total yield and the amount of nitrogen already available from soil reserves. Predicting either of these factors is difficult, because weather plays a significant role in eventual yields and in the amount of soil nitrogen released, held or leached away. Nitrogen recommendations have, for the most part, been based on the past (previous nitrogen rate studies relative to yields obtained) or the future (predicting your yield for that year). What growers need in an era of high-cost nitrogen and environmental worries, however, is an accurate indicator of exactly what their crops need on the day a sidedress application is scheduled. Real time or "in-crop" estimators of nitrogen requirements developed more recently include leaf chlorophyll levels, plant tissue tests for nitrogen concen-tration, and soil nitrate testing. Researchers have also been investigating the concept that leaf color, or some sort of light reflectance measurement based on leaf color, could indicate a corn crop's need for nitrogen. Bill Deen and Jo-Anne Wakem at the University of Guelph's Department of Plant Agriculture are exploring a method for using light reflection to indicate nitrogen requirements. The unique aspect of this project is that the researchers are attempting to drive the system through measurements taken from corn plants in the 6- to 8-leaf stage. In this way, adjustments to sidedress nitrogen rates could be made from the collected results. 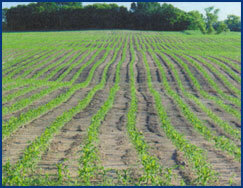 The project involved a series of experimental sites where one row of the corn planter delivered a significant amount of nitrogen (30 to 50 lb./ac.) in a band close to the row while the other row received zero nitrogen (top picture).The crop reflectance meter takes a measurement directly over the top of the corn plants from each row (bottom picture ). The aim of the research is to first define th differences in reflectance between corn plants that have zero planting-time nitrogen, and those with sufficient (30 lb./ac.) planting-time nitrogen. The second step is to then demonstrate that this difference in reflectance will indicate the soil's ability to supply nitrogen and hence give an indica-tion of how much additional nitrogen should be sidedressed. For example, if you planted corn into a field high in residual nitrogen because of previous manure or legume crops, you might expect no difference in green color between fertilized and unfertilized rows. That would be a signal to apply little if any extra nitrogen. If, however, unfertilized rows at the 8-leaf stage were considerably paler than fertilized rows, the reflectance meter would measure that difference and indicate the need for a higher rate of side-dressed nitrogen. Differences in leaf color and reflectance between fertilized and unfertilized rows were obvious at many of Deen's and Wakem's experimental sites last year. comparisons of those rates with the differences in reflectance. The reality of mounting a light meter on the front of a tractor to assess reflectance levels, send this information to an on-board computer, and have the computer adjust the nitrogen application rate on-the-go is still some distance off. But high nitrogen prices provide motivation to keep investigating the potential of this science. Some of last year's results reinforce the practical experience of more and more corn growers who use sidedress nitrogen systems. That is, a significant amount of nitrogen should be banded with the planter if the remaining nitrogen is not going to be applied until sidedress time. Over the 7 zones examined by Deen and Wakem in 2000, corn yields in rows with zero nitrogen put down at planting averaged 9 bu./ac. less than in rows that got about 30 lb./ac. at planting (Table 1 below). Coming in at sidedress time with 200 lb./ac. of nitrogen couldn't make up the difference even though 200 lb. was considerably more than the crop required. 1. Actual N applied through the planter varied from 26 to 44 lb./ac.